These 25 ton brake vans were first introduced in 1928 by the Southern Railway and were built on a similar chassis to the previous ‘Dance Hall’ type vans but with a smaller centrally mounted body. Due to the more cramped style they were soon known by staff as ‘pill boxes’. They were built in various batches with last being constructed in 1948. Throughout that time a number of variations in the design were evident. These modifications ranged from the position of the lookout duckets, open or closed axle guards, planking arrangements, with or without sandboxes that were either fully or partially sheeted and also fitted or unfitted with vacuum brakes. The Bachmann ready to run models of these vans, first announced in 2011, have now arrived and initially these have been released as 6 variants taking into account a number of the different manufacturing batches of the originals. Overall these are very good representations of the original, crisply moulded and a wealth of fine detail including separately fitted handrails (and body side vacuum pipe on later BR versions), brake gear including central pull rods and a bag of fittings for the brake rods and protectors around each wheel set (see below). It is a shame that the lamp irons on the body ends are simple mouldings, although the higher end rail mounted lamp irons, although very slightly overscale, are nicely separately applied. There are a couple of errors that I outline below but on the whole these are excellent models and Bachmann should be congratulated for their introduction and talking into account the variations of the prototype. Left Hand ducket, even planked in Pre 1936 livery. Note the stove chimney position, just visible in front of the LH roof vent, next to the ducket rather than opposite it. The first 80 brake vans built from 1928 were to diagram 1578 and had left hand look out duckets, open axle guards, even planking and fully closed in sheeting for the sandboxes. 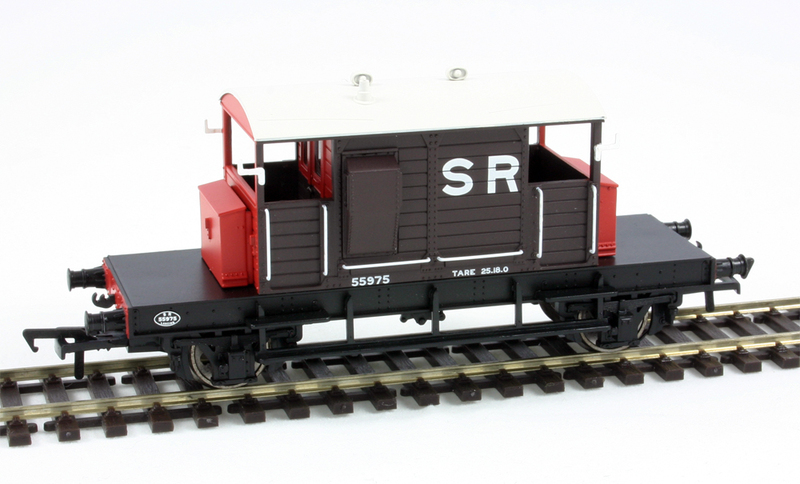 The Bachmann ref 38-400 represents number 55975 in Pre war SR livery with a white roof. There are a couple of errors with this model, the main one being the fact that position of the chimney for the guards stove is in the wrong place being next to one of the lookout duckets rather than on the opposite side (i.e. the correct position for a right hand ducket version). As the body and roof are one single moulding this is not a simple assembly error. Whilst the livery is crisply applied the sole bars are in black when they should be painted brown as per the body sides. The buffer headstocks are also in black, which is correct, although on some vans the headstocks were painted in the vermillion red as per the ends. Bachmann have also released an even planked left hand ducket version as ref 38-801 in BR unfitted grey No. S55953 but with the later fitted additional end windows and without the sandboxes that were removed in BR days. It has been noticed by some that usually lettering on on the unfitted grey livery would have been painted on a black panel. Due to the internal layout and the relationship of the door and the ducket,meaning the door opened into the space where the guard was likely to be sitting, all subsequent batches were built as a mirror image (as some have pointed out simply hanging the door on the other side of the frame might have been simpler!) with right hand look out duckets and the diagram number changed to 1579. 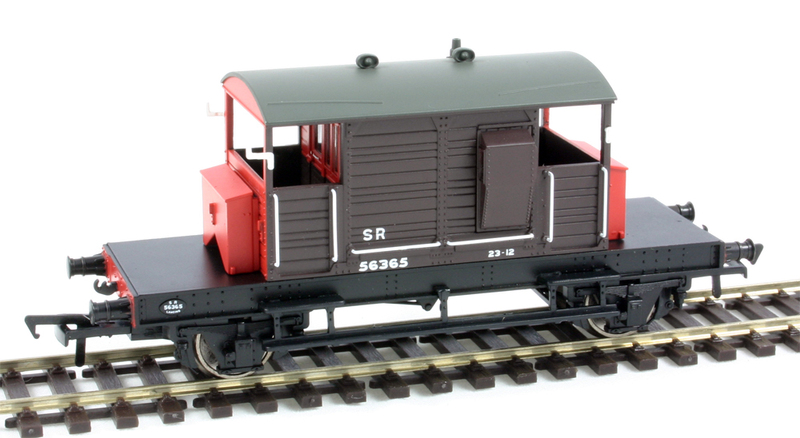 Bachmann have released an even planked right hand ducket version as ref 38-803 in BR ‘fitted’ bauxite. No. S55583 also without the sandboxes This model also has the vacuum brake gear and bodyside pipe, although no pipes for the bufferbeam are fitted or included, along with the later fitted additional end window. Whilst stove chimney is in the correct location for all the right hand ducket versions. The vertical brake pull rod linkage between the guards brake handle to the pull rods on the underside of the chassis next to the V hangers should, like the stove chimney position, also be handed between left and right ducket versions. Unfortunately Bachmann appear to have only moulded this correct for the left hand ducket versions so is incorrect for all the right hand ducket versions.. 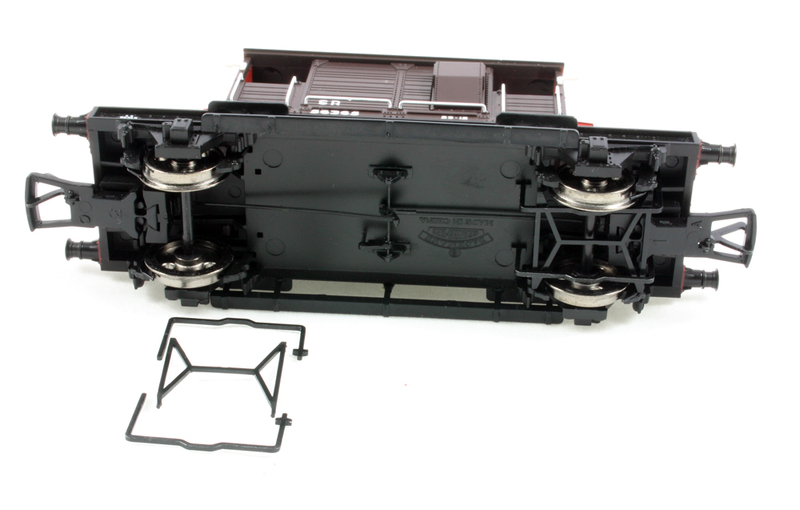 This and the rest of the models detailed below have the closed axle guards. Examples built after 1937/8 had the alternate 2 wide plus 2 narrow planking arrangement and the addition of a second window in each end to allow more daylight inside the van. As noted above earlier built versions also had the additional end windows added mainly in BR days. The Bachamnn release 38-403 has the 2 + 2 planks, right hand ducket, closed axle guards and the later sandbox design without the full sheeting in post-War SR livery with grey roof as No. 56365. Again on this model the solebars should be painted in brown rather than left in black. The small SR lettering appears to be slightly larger than the 4” lettering it is supposed to represent although the van number is a correct scale 4″ high. It should be noted that some retailers and magazines have incorrectly referred to this livery as being SR grey which could cause confusion as the livery is still SR brown but has a grey roof! Bachmann have also released ref 38-404 with the 2 + 2 plank, right hand ducket, no sandboxes, vacuum brake gear and bodyside pipe (same comment above about buffer beam pipe applies) in BR departmental olive green as No. DS 55400. A view of the underside showing the separately supplied brake fittings with them fitted around the right hand wheelset. Supplied with each model is a small bag of the brake pulls and guards for fitting around each wheel set. It would perhaps have been nice if Bachmann had included a simple diagram to explain to all where these should be fitted. The pull rods are fitted first locating into small holes in the back of each of the brake blocks and then a pair of the guards are fitted into the square holes in floor with the longer leg going at the buffer beam end. These items are slightly fiddly to fit and require a small amount of glue to hold into place. Review updated 16/10/12 to include RH Ducket brake gear error. 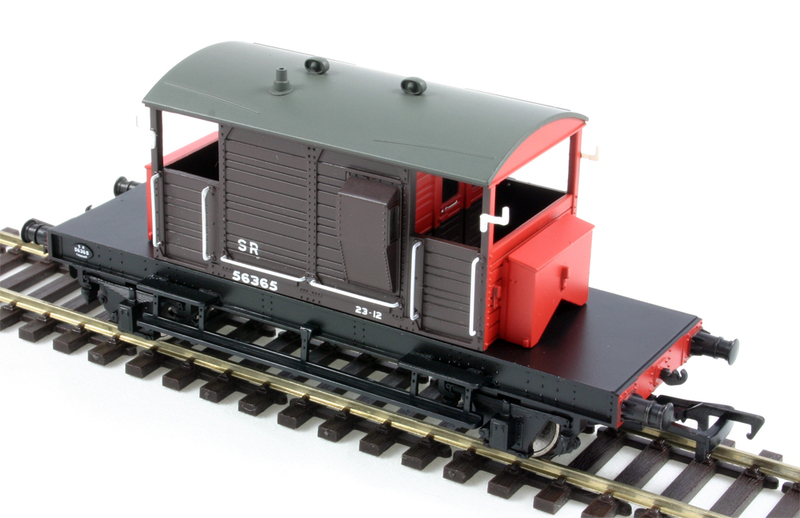 Thanks for the review of the Pill Box brake vans, I have one or two on order and I am looking forward to their imminent arrival. On the whole I enjoyed the review, but the spelling mistakes and grammatical errors spoiled it a little. That said there’s a job for you with Hornby Magazine or Model Rail; a lot of the time they can’t get the facts right either! Thanks for the comment and feed back, serves me right for trying to post in a hurry before heading out for the day. I think I have found most of the mistakes now. Sorry if my first comment appeared harsh, it wasn’t meant to be. Anyway said Brake Vans have all arrived at Portsmouth Central and I must say I’m most impressed; despite the minor errors. I’m sure a little painting and weathering will improve the models further. One thing: after performing a chimney transplant, don’t forget to ‘adjust’ the clear plastic packaging of the Bachmann box as this is handed for the chimney position. No your comment wasn’t harsh I welcome all constructive feedback, and I did kick myself when I realised just how many errors had crept in. Thanks for the heads up on the handed packaging which I am sure will be useful for readers of this blog (as I don’t store any of my stock in the original boxes as it just takes up too much space and is too slow at exhibitions to set up and pack away. It is possible to cut the chimmney off with a craft knife and then glue it to the correct position. Rest the model on its side on an old table mat so the body is on the mat and the side frame is below the mat in the gap thereby created. This avoids the side frame taking the pressure when you are slowly cutting. The body takes the pressure through the ducket thus avoiding the grab rails being damaged. I have seen references saying the sole bar was sometimes black on SR brake vans, it’s very difficult to determine the colours on black and white photos to confirm this! I agree that it should be a reasonably simple job with a nice sharp blade to re position the chimney on the LH ducket versions but will need either some careful paint touching up or more likely weathering to hide the inevitable mark. I also looked as as many photographic references as I could and even in black and white images to tone of the solebars was usually different to the black of the axle boxes to convince me that in most cases the solebars were painted brown. But I am sure there were a number of exceptions! After waiting 60 years since Hornby-Dublo stopped making their tin plate pill box brake van I have received my Bachmann brakes and had an opportunity to compare them with the SR brake vans at Swanage. The two SR 25t brake vans at Swanage both have even planks and right hand duckets. On the grey prototype S56400 is written in white letters on a black background as are the words Not in Common Use. To work between Swanage & Furzebrook. There are no sandboxes on the prototype or the model. The model has S55953 and 25-6 in write letters directly on the grey body. On the bauxite prototype the lettering is M360369 25T XP painted directly on the body as on the model. It has sandboxes and cylinders on one side mounted above the chassis. The model has no sandboxes or cylinders. The lettering is S55583. WB 16’0″ 25-4. It will be interesting to see how many Bachmann sells and which one sells out first. 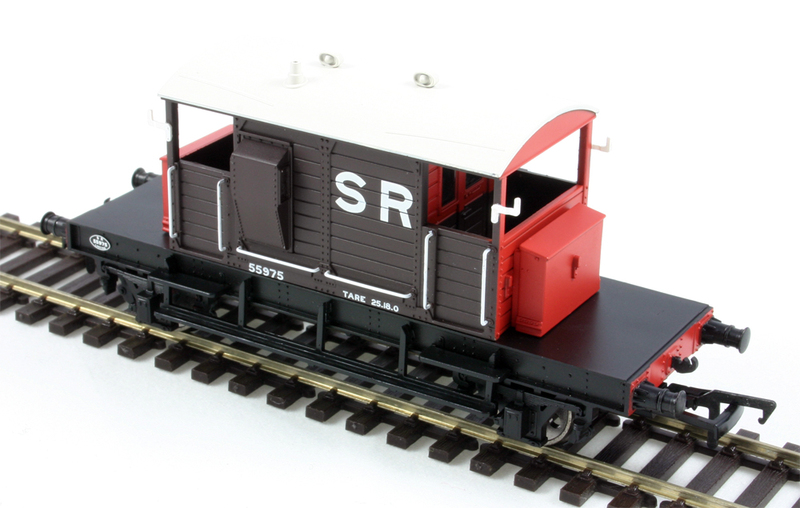 It is a pity Hornby-Dublo did not bring out an SD6 SR 25T brake van with their R1. I have finished painting the roofs of the surgically transplanted chimney brake vans and I have to say that I can not see where the original positions were. I did ensure that the site was finger tip smooth prior to painting. I opted to paint the whole roof rather than repatch which I think looks obvious. The point to note is that the positioning of the chimney is actually more critical than first appears due to the slant of the base and the size of the chimney (leaning chimney of pillbox). I hope my notes have been helpful. Now looking forward to a new set of window/ducket/planking etc variations! Original condition right handed ducket SR primarily. I still can not believe the number of variations Bachmann have provided, 4 types of end window and 2 types of sandbox are a couple of the available variations not mentioned elsewhere. There is a picture of the prototype of the Bachmann Southern Railway brake van 56365 on page 191 of Hornby Dublo Trains by Michael Foster published by New Cavendish Books. It is a black and white photograph but the solebar is the same shade as the body so it should be dark brown. The wheel rims were white. Platform Models took 7 SR brake vans to the Christchurch exhibition. At the end they had one Southern Railway brake with a white roof. Swanage Station had 13. Now there are 5 left: 2 of each Southern Railway brakes and a light grey British Railways SR brake. It looks like there is a greater demand for the British Railways brake vans. Hi Robin yes I believe sales have been good which bodes well for other livery variations in the future.